Happy Monday everyone!!! Today is the last day in August and it is pretty unbelievable how fast the days are flying by; I am trying to enjoy the remaining few days of summer before the cold season kicks in. Today’s post showcases a great way to incorporate color and print to a work style. Personally, I am a fan of mixing bold items with simple or monotone pieces. 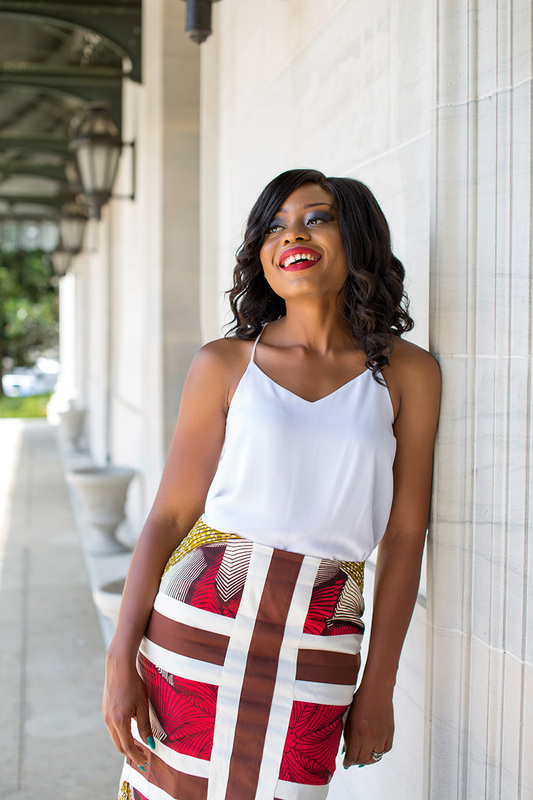 This Timi Alaere skirt is a bold piece that is vibrant and when paired with the white top, it gives a fresh feel to the look. A blazer (maybe a brown one) will look great with the piece which is what I did when I wore it to work last week (as seen on my Snapchat: Jadore-Fashion). I completed the look with red pumps to complement the skirt. Beige or brown pumps will definitely look awesome. Thank you always for stopping by, have a lovely day! This is a great option for people who are stuck in the office all day. A little color always makes me happy! You look stunning Stella! Such a gorgeous skirt! I love the skirt and print. Thanks for sharing. I would love to subscribe to your blog for further details about tending fashion.